From our Unique Beaded Fringe Collection (trims under 1 1/2" long)"Nevada Gold " is a beautifully crafted beaded fringe trim in a long variegated length. 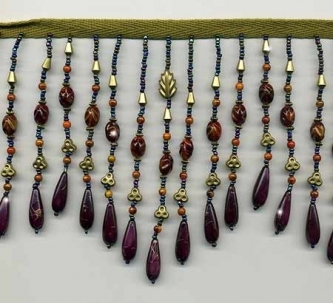 Matte gold stylized leaf designs are combined with beads in rust, turquoise blue, brown and just a touch of deep aubergine in the bottom bead. (Be sure that you click above to view the larger image of this trim so that you can see some of the detail a little better). This is a high quality, very full beaded fringe with exceptional detail and craftsmanship. The longest beaded stands are 5 " long not including the 3/8 " light green cotton ribbon. Perfect for apparel or home decor.